Canada is Greener, Or is It? The Grass is Not Greener in Canada. Or is it? 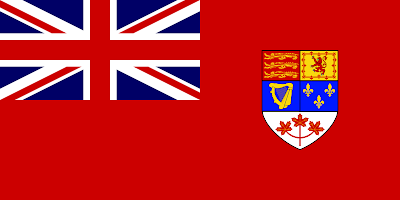 This was the Canadian flag until 1965. Found at the blog No Fixed Address. I was quite pleased by the interesting discussion that ensued in the comments box on my 4th of July posting. There were many really informative and insightful comments. I am quite fortunate and thankful to have the readers and commenters that I do. You guys rock! I was also discovered to be a wannabe Canadian. Well, as Elaine said in her comment, “I kinda suspected that from your previous posts.” I’m sure she’s not the only one. But I wasn’t the only American discovered as a wannabe Canadian. There were at least two others who expressed similar sentiments. Rich humorously (but at least half seriously, I’m thinking) quipped that July 4th is “the day I like to pretend I’m Canadian.” And Christine wrote (among other very insightful comments on the post) of her own thoughts about emigration over the years. I’ll continue to “out” myself here regarding my “wannabe Canadian-ness.” The truth is that I have thought about emigration to Canada off and on since my teens. (And that’s a long time; I’m getting old 😉 Of course, the health care issue, as discussed in the 4th of July post has long been a major draw…. But it’s not just that. What I am about to say may sound really…I dunno, “corny” or unrealistically “romantic”, perhaps? I can’t really find the word, but anyway…. 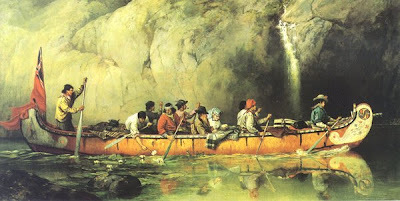 I have done a fair amount of traveling in Canada across the decades, both east and west. More than most Americans, I’m guessing. I have always felt a special draw when I am there that I can’t explain. All I can say is that it seems to feel more like “me” to me than any place I have ever been. The only place that comes as close is my adopted home state of Minnesota, with its lakes and woods that get into one’s bloodstream (mine anyway), where I now live quite happily and have since 2001. And my fondness for our neighbours (Canadian spelling there 😉 to the north has increased. But the grass is not greener in Canada. I know this. One of the things that has long saddened me and continues to about America is our foot dragging, denial, and downright “unrighteousness” on the environmental front. In the comments to the 4th of July post, I was honored to be visited by Richard, a writer from Nova Scotia whose blog I recently stumbled upon and started reading. In his great comment, Richard pointed out some statistics showing that Canada is not particularly on track with “green-ness” either. Canada is, in fact, poised to overtake the US as the world’s #1 per capita polluter. And do you know about the “Athabasca Tar Sands” in Northern Alberta? Maybe not. It’s kind of a “dirty little secret.” This is one of the most environmentally destructive projects ever anywhere…. -Oil sands mining is licensed to use twice the amount of fresh water that the entire city of Calgary (metropolitan population over 1 million) uses in a year. -The toxic tailing ponds are considered one of the largest human-made structures in the world. -The ponds span 50 square kilometers and can be seen from space. Basically what it amounts to is turning most of Northern Alberta into a gigantic toxic waste pond. The grass is not greener in Canada. And then there is this man. What a good looking guy he is, eh? 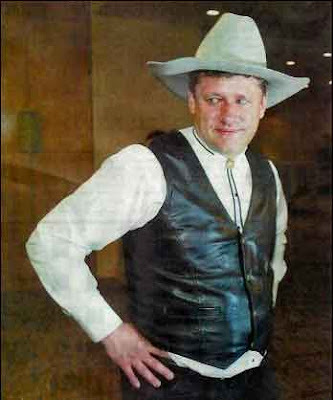 That’s the current prime minister of Canada, Stephen Harper, in case you don’t know. I think he secretly wants to be George W. Bush. Am I wrong? Which of these sayings sounds more “individualistic” to you? Which one sounds more “communitarian?” Just pondering…. So perhaps the grass is no greener on the Canadian side of the border. But I still think about becoming a Canadian…. This entry was posted on July 8, 2008 at 3:51 pm	and is filed under Uncategorized. Tagged: canada, environment, greener, oil sands, oilsands, stop, tar sands. You can follow any responses to this entry through the RSS 2.0 feed. You can leave a response, or trackback from your own site.